Since its foundation in 1976 Social History has published over 200 articles on the history of the European continent from antiquity to the contemporary period. This Virtual Special Issue aims to showcase our best writing on European social history, highlight the range and diversity of material in the journal, and show how Social History has encouraged critical reflection on the methodologies, historiographies and approaches that shape these fields. As an international academic journal, Social History explores how lives are lived, understood and made sense of over time, without restriction of place. The topics covered over the last four decades have been eclectic and broad. Whilst reflecting the opening up of new areas of enquiry, many remain perennially relevant. This Virtual Special Issue includes work from the early days of the journal on violence, capitalism and the modern state (by Alf Lüdtke) and on the politics of language and national identity (by Patrice L. R. Higonnet) which are pertinent to debates today in Europe and beyond. Early modern responses to child poverty and street begging are the focus of Joel Harrington’s article, which also deals with the history of children and young people and the production of popular culture. Over the years Social History has published a number of important interventions on witchcraft, magic and popular belief, reflected here in the article by Marijke Gijswijt‐Hofstra, which offers insights from the Dutch perspective. Court records – providing a crucial lens on social conflict and its resolution as well as the construction of social identify, honour and reputation – are explored here by Trevor Dean in his study of gender and insult in late-medieval Bologna. In recent years contributors to the journal have offered important re-assessments of the experiences of the twentieth century – armed conflict, fascism, socialism, the Cold War and its aftermath – across Europe and the Soviet bloc. Two pieces have been selected here as exemplary of these new approaches. Anna Krylova’s article argues for a more nuanced understanding of Soviet subjectivity – ‘of imagining and living socialism’ – which does not simply reduce it to an unswerving Bolshevik origin. The social history of the environment – and in particular of garbage and waste management – provides the impetus for Anne Berg’s examination of the politics of recycling in Germany and Nazi-occupied Europe, which she compelling shows ‘were intimately connected’ to the Third Reich’s ‘destructive fantasies of purification’ (453). 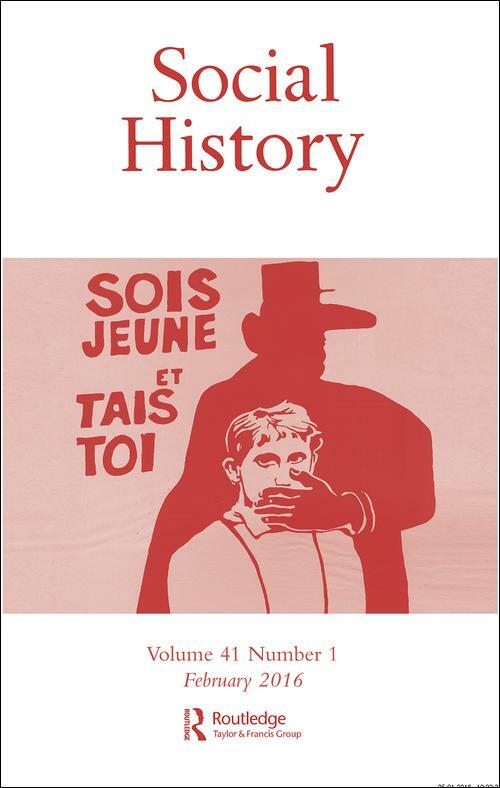 Social History has experimented with a range of formats to promote discussion of the differing political and economic conditions shaping the discipline in different parts of Europe. Special issues – more recently on Spain (2004), Hungary (2009), and the Czech and Slovak republics (2011) – have identified specificities as well as shared intellectual trajectories. Our 2018 ‘Round Table’ on ‘The Social History of Modern Greece’ (43.1) highlights the implications of political change and financial crisis for the ways in which modern Greece is studied. This has included a growth in approaches that are ‘more systematically transnational, entangled and comparative’, shaped at least in part by the need to move outside of Greece for those seeking academic employment and publication. To reflect the importance of these kinds of discussion in the journal over the last decade, this Virtual Special Issue includes an interview with Michael Pullman, Director of the Institute of Economic and Social History at Charles University, Prague. Pullman discusses the complex effects of the Stalinist period and of the changes of 1989 on the production of history in the Czech and Slovak Republics. 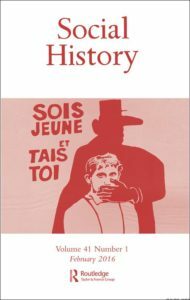 Whilst work on Germany, France and the Iberian peninsula has long been a mainstay of the journal, Social History is committed to supporting the development of excellent historical scholarship in central and eastern Europe as well as other areas conventionally constructed as a hinterland between east and west. Finally, in showcasing the diversity of European history coverage in the journal, it is essential to highlight international, transnational and global approaches that move beyond borders and place the movement of people, goods and ideas under the microscope. Laurent Dubois’s 2006 article is a very significant intervention that proposes the writing of a history of the Enlightenment in relation to the French Atlantic, which not merely seeks to integrate ‘the thought and actions of a range of communities in France and the Caribbean’ (3) but, in so doing, shifts and de-centres our understanding of European history itself. Xosé M. Núñez Seixas provides us with an illuminating synthesis and overview of work on the experience of migrants in the Spanish Transatlantic, highlighting the importance of associations in building social and economic networks, in shaping migratory patterns, and in forging cultures and identities. We very much hope that this collection of articles is of interest to you – there is much more to explore in our archives. We hope, too, that you will be interested in submitting your own work to Social History. Please send us an email (socialhistory@ed.ac.uk) if you are in Belfast in April for the European Social Science History Conference and would like to discuss your work, or come and meet us at the Taylor & Francis stall. This entry was posted in Uncategorised on 22nd February 2018 by Grainne Goodwin.